The Uninterruptible Power Supply (UPS) unit consists of a UPS controller module (PIPUPS) and a smart battery package (PIPBATT). Together, this system provides an ideal solution to bypass short input power losses or to safely shut down the system after longer power down periods. Based on Smart Battery technology, the systems behavior is similar to that of a laptop. Therefore all features in the operating system can be used without additional drivers. The combination of a PIP and this integrated UPS unit is a complete, compact and clever solution. It is ideal for industrial applications that require secure shut down under any circumstances or where short input power outages may occur. The PIPUPS module can be used in all Celeron M and Pentium M based PIPs. For example it works on all PIP8-11, PIP10-2, PIP11-1 just to name a few. This solution can not be used with the PIP20 platform. The PIPUPS requires an DC input voltage between 20V and 28V to make sure the battery will be charged properly. Lower input voltages are not sufficient. Currently the PIPUPS controller only supports Lithium-Ion smart batteries. Their operating temperature range is -10°C up to +50°C. As the PIPUPS system uses the ACPI BIOS interface functions to communicate with the Operating System, the OS has to support this as well. Modern OS like Windows 2000, Windows XP or Linux use and include ACPI to handle the power management. When using Real Time OS this needs to be checked. PIP62-1: not possible as this housing is to small. PIP83-1: minimal required housing for PIPUPS solution. Caution: no space for additional PC/104 or PC/104-Plus cards! PIP120-1: With this housing, two additional PC/104 or PC/104-Plus can be installed along with the PIPUPS. The PIPUPS is the required UPS controller module to build up the UPS unit. 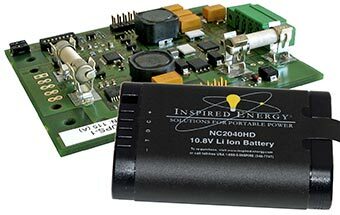 UPS controller module for internal smart battery interface. The bypass time depends on the used battery package capacity as well as on the system load. UPS controller module for external smart battery connection. The bypass time depends on the used battery package capacity as well as on the system load. The PIPBATT is the required smart battery package to build up the UPS unit. Smart battery 2.4Ah, 26Wh, including a rugged battery holder and internal wiring, electronics and mounting. This solution offers about a 30 min autonomy of a PIP10 at full load. Smart battery 4,8Ah, 52Wh, including a rugged battery holder and internal wiring, electronics and mounting. This solution offers about a 60 min autonomy of a PIP10 at full load. The used OS must support the ACPI power management interface. No special driver or application is needed. Modern OS like Windows 2000, Windows XP or Linux use and include ACPI to handle the power management.